Commercial theatres are touted to deliver an immersive experience as there are powerful speakers that handle different types of audio including dialogues, soundtrack and ambient noise. These speakers deliver a detailed soundscape making movies great. 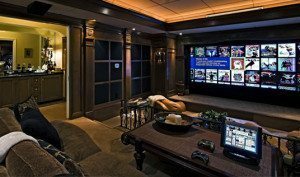 In order to get this experience right at the comfort of their home, users build custom home theatre rooms. Such systems focus on details such as surround sound system, screen size, theatre seating and more. Though there is no denying that these details are important, the best experience is possible only with focus on the room acoustics. For a home theatre system to provide the best and desired experience, you need to make sure there are proper home theatre acoustics in the room where you install the home theatre system. After all, if you do not have comfortable seating to indulge for hours, you will not get the best experience. When you have addressed the acoustical issues that persist, you will be able to enjoy the desired experience that is more involving and immersive. Keep in mind that improper hometheatre acoustics will ruin the sound that the great speakers produce. These are just a few tips to get the best experience from the home theatre system. You can get to know more details from here. Great hometheatre acoustics controls reflections to a great extent. Sound covers a broad spectrum from lowest bass of an explosion to sparkling highs of tinkling of glass. The human voice belongs to the middle. While low bass tones from speakers bounce around the room based on the dimensions, the tones will build up in specific areas causing problems. Some low and high frequencies can be canceled by reflections and you might hear little bass. So, it is important to have a control on the reflections to enjoy the details in a movie. Acoustic treatments called bass traps are a solution to the bass modes. Typically, the bass traps are placed at the corners of the room where you have installed the home theatre system. These bass traps are large enough to trap the low bass reflections. These can be a great choice to capture low frequencies and minimize modes so that the impact of bass is reduced. In addition to reducing the reflections, it is important to find balance and eliminate the modes than deadening the sound. If you cover the room completely that it cannot absorb sound, then you will end up with a room that lacks dynamics. Do keep in mind that well-designed theatres will be designed to render a perfect balance between dispersing, reflective and absorptive panels positioned around the room. While handling home theatre acoustics, you need to make sure that the acoustics treatments are done soft. You need to eliminate the sound bouncing off the walls and windows in a soft way. The best thumb rule is to use large houseplants, be it fake or real, area rugs, heavy curtains, tapestries and wall hangings to bring in a difference. For your dedicated home theatre room where you like to enjoy sports, TV and movies, you have many options of acoustic treatments. You can choose from basic absorptive wall panels or a full blown acoustic treatment package that is hidden behind a stretched fabric system covering the wall surfaces. Basically, the acoustic treatments of the home theatre room will disappear along with the aesthetics. This way, your home theatre equipment will render a great performance and user experience. Though home theatre acoustics are important, this is just a piece of the puzzle. It is important to get the right tools that are necessary for the proper functioning of the home theatre system, so that you enjoy the best sound output possible right at the comfort of your home. You need to understand that it is equally important to choose the screen size, theatre furniture, equipment, sight lines and wiring to get the custom theatre experience at your home. Also, ensure that everything is installed and calibrated properly.